And of course I had to get one with me and the kids too... This is my little "alabama fan" at heart naturally b.c his daddy is; so i was not going to buy him an auburn shirt basically b.c he has told me he only wanted to wear alabama stuff so i brought him a navy and white striped polo shirt to wear but when we got down there he changed his tune... he wanted a shirt, wanted his face painted, and bought him a shaker and was walking around shaking it and yelling warrrrr eagle... people would walk by and say warrr eagle to him and he would shake his shaker and finish it with "hey"... he was having FUN! Maybe there is hope for me after all... think i can convert him??? The only thing we did not get to show them and take pictures of was the stadium... it was pouring down rain so we did a drive by and i wanted to take them to momma goldburgs and get them some nachos and sweet tea but we will have to save both of those for next time. While we were there i took a picture of the kids with my phone and sent it to my dad... he was pumped...looks like we will be going back down there this year for a game... he has longed for the day he could take little man to an auburn game... who am i kidding... i have longed for the day too! Your kids are adorable but would look much better and crimson and white! Roll Tide! 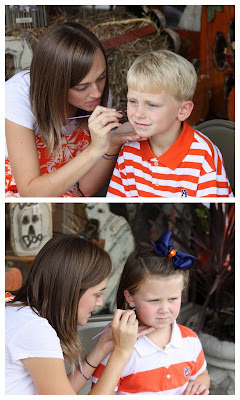 Keep workin' on him ... you'll turn him into a (Pat) Dyed-in-the-wool Auburn fan before ya know it! I can't wait to take my little girl to campus one day ... WAR EAGLE! Love all the pictures! War Eagle! GO TIGERS!! I loved being on campus as a student at AU, especially game days in the fall...but I also thoroughly enjoy taking our kids down to share in the AUBURN experience! The picture by the sign is so cute! War Eagle!